Posted on August 7, 2017 at 11:57 am. 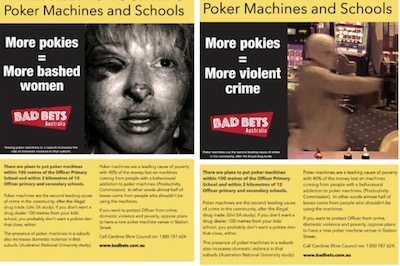 Anti-gambling group Bad Bets has been slammed for distributing flyers with graphic images at school gates in Victoria’s Officer area in protest of a new pokies venue being proposed nearby. Bad Bets Australia is a not for profit organisation that aims to “show which bets are rigged, how they are rigged and who is doing the rigging.” The group is campaigning against a proposed new pokies venue within 100 metres of the Officer Primary School and 12 kilometres other primary and secondary schools. The flyers urge parents and members of the community to contact local Cardinia Council to voice their concerns about the new Station Street pokies venue to protect the area from crime, domestic violence and poverty. Despite the flyers being labelled with a warning for parents not to show the pamphlets to their children, Bad Bets has been slammed by Education Minister James Merlino and Parents Victoria for distributing the graphic material so close to school grounds. Victorian Education Minister James Merlino said he does not support the distribution of Bad Bets flyers near schools and that the information should not be shared with children. But not everyone is condemning the move, with top gambling researcher Dr Charles Livingstone saying Bad Bets campaign is based on factual research. Bad Bets spokesperson Rohan Wenn is questioning why a pokies lounge would be approved in the middle of Victoria’s newest education hub. “What are you teaching kids about addiction and exploitation?” he asked. While Mr Wenn agreed that children shouldn’t be exposed to the imagery on the Bad Bets flyers, he said it was “absolutely” necessary that parents do. “If you are offended by a photo of someone who has been assaulted, surely you should be more offended by the fact that poker machines increase domestic violence,” he said. The Cardinia Council approved a new pub with pokie machines in March, much to the disapproval of local residents, many of which are first home buyers.